Rich lather gentle cleanses without overdrying. In love with this products and how it doesn't dry my skin out! Got from Walmart and I'm still on my journey for skincare products. I absolutely love this soap!! This helped clear my acne up time and time again!! I use it every other day so that I don't dry my face out too much. Definitely the best bar soap for acne-prone skin or skin with uneven tone and texture. It left my face feeling fresh and clean and I didn't get oily at all throughout the day. 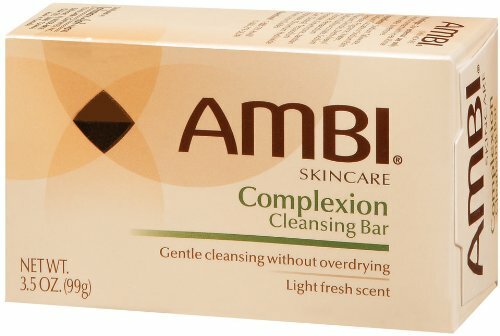 I've been using the ambi skin care completion cleansing bar which has a really nice scent I've used it on my face to help clear up the dark spots I have from working in the sun..
Ambi Complexion Cleansing Bar makes daily cleansing easy. It is enriched with proven cleansing agents to effectively wash away surface impurities and makeup for soft, clean skin. Its rich, clean-rinsing lather also has a light, fresh scent.